Well, it's official - Danny Hope has been fired. And while you can read his story all over the internet, I felt like I needed to add my two cents. I've never met the man, but from everything I've heard and everything I've seen, Hope was a great guy and had as much Purdue pride as anyone. After the Illinois game, Hope was interviewed on the field and ended it with a resounding "Boiler Up!" I LOVED it. In fact, if Purdue was to make it to the Rose Bowl and I got to choose the coach that took us there, I probably would have chosen Danny Hope. 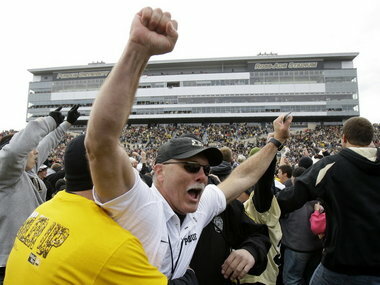 He was an awesome guy to root for and his energy and love for Purdue was, at times, a huge motivation to the fanbase. I mean, who can forget Hope giving his whistle to a student while celebrating on the field after the 2009 Ohio State win? Unfortunately, he just wasn't ready to be a big time coach. I find myself with conflicting feelings. I feel bad for a man who was a great representative for the University and who ran off the field yesterday, head held high with his teary-eyed wife. At the same time, he was given 4 years. 4 years to prove himself that he belonged. And when he finally put together a team that had fans, players, and coaches thinking Rose Bowl, his team laid an egg and the fans responded. If Purdue wants to sell out Ross-Ade, they need to consistently be in the Top 25 - something they haven't even sniffed in the last 5 years. It's a bittersweet ending for Hope, but it had to be done. Thank you for your time at Purdue, Danny. Your fire and heart will truly be missed. Totally agree with everything you just said.